The Babadook begins with a a woman falling through what feels like endless black space until she hits her bed to realize it was all a dream. As it turns out though, these moments of seeming fear may be the most peaceful moments of Amelia's (Essie Davis) day. She wakes to a barren house, haunted by the past and frozen in time by the future that never came. She has a five year-old son, Samuel (Noah Wiseman), who is nothing short of a terror that drains her of her energy and will to live on what feels like a daily basis. In fact, Samuel is made so grating and infuriating that we understand the extreme lengths the film pushes Amelia to. It is clear in this simple set-up of a relationship and the disdain surrounding Samuel from the only family we're privy to seeing that this is intended to be subtle horror. That there is more to the story than the intent to elicit jump scares, but rather to elicit full on emotional exhaustion by the time things come to a head. These qualities allow The Babadook to stand apart from the handful of other small, independent horror releases. Granted, I haven't made it around to watching such films as The Sacrament or As Above, So Below, but this seems to be on another level completely, engrossing the audience as much through its filmmaking techniques as its story. Writer and director Jennifer Kent combines the two to create a truly effective film, or at least half a film, before it spins out of what feels like even her control in the last half hour. That said, the elements that make up the building tension of the first hour are so expertly crafted and handled in such a refreshing manner that we can't help but give into the thought that it's the heightened expectations set after our experience with the film so far that allow the conclusion to not live up to them. This is mainly true because we care more about the two central characters than the titular villain of the piece and the third act relies too heavily on the actions of this mysterious creature. Overall the film is more about the convergence of Amelia and Samuel's breakdowns concerning the memories that come to mind any time Amelia looks at her son and the troubled, difficult child he has become. Both experience a breakdown in the film, but they offset each other in such a way that we never sway from our allegiance to Amelia even when her actions become questionable. Samuel is honestly such a horrible kid in the beginning that even the slight premonitions and hallucinations Amelia begins having are looked on as forgivable. Making their cases all the more compelling and maddening are the performances of Davis and Wiseman. Davis truly looks as if she is at the end of her wits, barely holding it all together before exploding while still somehow managing to keep her sweet facade intact. Wiseman, on the other hand, as a child actor feels extremely competent in his execution of this desperately frustrating child in search of some set of limits. I was moved to feel extreme sympathy for Amelia in this situation where no one else sees the full picture and who feels the need to have to explain her every action and come up with an excuse for her sons behavior. This is clearly a woman who has been dealt a tough hand in life and is trying to make the best of a situation she feels she'll never win. She wears the look of defeat constantly and only in a brief moment of free time near the beginning of the film does she catch a glimpse of what tranquility might feel like. Even here though, after taking a moment for herself, she is made to feel guilty and thus the annoyance of Samuel is driven even further. Kent pushes us and Amelia to the edge with Samuel that is only aided by the discovery of the children's book that shares the title of the film. This disturbing tale told through a pop-up book serves both as the broad supernatural force that is haunting the characters as well as a metaphor for something bigger. Amelia (Essie Davis) and her son Samuel (Noah Wiseman) are haunted by a mysterious creature. So, is the Babadook, the actual creature I mean, just a projection of both Amelia and her sons internal struggles? As an audience we tend to believe he's not a real threat because despite the fact there is clearly something disturbing this mother and son there is also a sense of realism that suggests it's all in their heads. In fact, for much of the last half hour Kent supplies an unreliable narrator as we find it hard to trust anything we see. To this point, the stressful topics that plague Amelia and Samuel's relationship are brought out as Amelia fully retaliates on her child for what his existence represents and how she has allowed that to never truly make her available to him. Kent pulls us in early by heightening the sound mix on certain movements, certain actions that inherently seem small. She uses extreme close-ups to draw even more attention to these motions and explicitly creates an air of high tension that due to the sharp sounds feels as if it could break at any moment. These techniques somewhat fade into the background as the film progresses though which is both smart so as not to overly rely on them or become insanely obvious, but instead of using something else to build the atmosphere the director unfortunately returns to relying on the more conventional methods of scares. 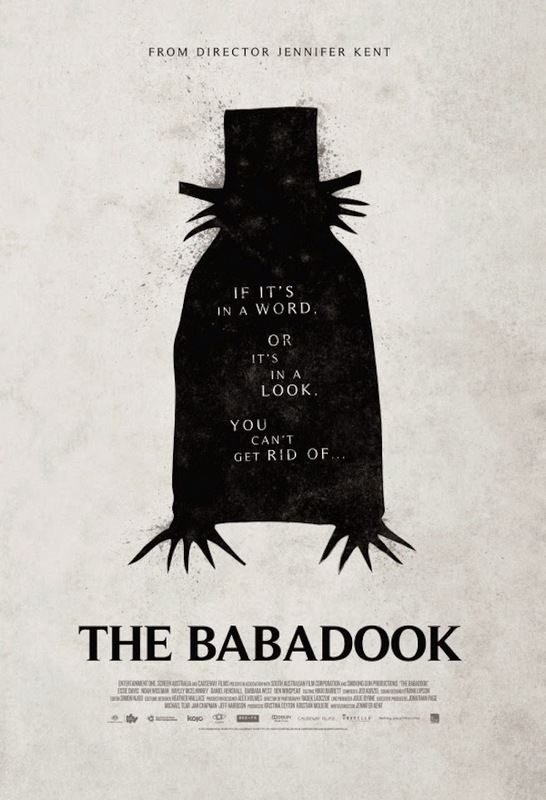 That isn't to say The Babadook ever becomes anything like what you would see in a studio horror flick as Kent is too intelligent to ever wholly divulge her main antagonist, but as Amelia takes on that role the effectiveness wains. The film touches on themes of loneliness and the inherent creepiness of children's books and the creatures they employ to distract and entertain our youth. It is also a disturbing tale made so more by the actions of our two main human characters and how they deal with the given circumstances of their real-world situations more than it is how they deal with the supernatural elements that make this a film able to be classified as a horror film. I'm convinced Kent could have made this without highlighting the titular character and she would have created just as compelling a story about a young boy coming to terms with the knowledge that him coming into the world took away the one relationship his mother held as her main reason for being a part of the world. There is nothing more effective here than its ability to fully illustrate the fact of what happens when you don't like the people you've been forced to live with, a fact that is often not considered. What has come of Amelia's life is clearly not what she would have picked for herself and Kent drives home this atmospheric, haunting take on the burden of motherhood and the unnerving responsibility of raising a problem child while incurring all sorts of judgements. Thus, we have the titular creature who may or may not act as an excuse for Amelia to lash out with her true desires, but nevertheless, whatever the truth of the situation, the character arcs, atmosphere and sound design allow the experience we endure with The Babadook to consistently feel like we're trapped within a nightmare we can't escape.